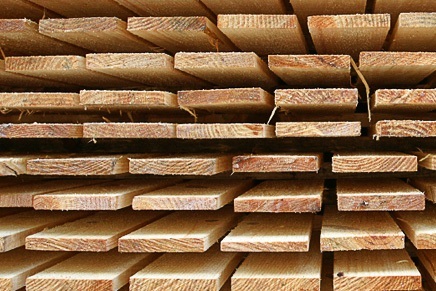 Sawn timber is a timber product that has been sawn from at least two sides. Sawn timber is differentiated based on quality class and type of timber used thereby making it possible to choose the optimal solution required. As wood is a natural material, its appearance and physical qualities are subject to variations. The properties are mostly affected by the type of tree and its growing conditions. In general, pine and spruce (i.e. conifer trees) are the trees most commonly used for extracting sawn timber for building purposes. This is especially true for construction as conifer trees are more resistant to humid environments. The strength properties of pine and spruce are broadly similar as both trees are usually not assessed as distinct from one another when making strength calculations. The strength properties of timber materials are adversely affected by the dimensions, number, location and shape of branches. Timber’s strength qualities are also diminished by wanes and defects caused by rot. Sawn and planed spruce and pine materials can be told apart as pine contains more resin and has a darker complexion. The pine’s rings are more distinct with branch roots darker. The exterior appearance of wood is also affected by sawing traces and by the way the surface has been treated. Abscess poses the greatest possible danger to timber. The spruce is less susceptible to abscess than pine, which has a darker core more resistant than its outer layers. The abscess resistance of timber can be enhanced by applying chemical protective agents. For the protection of outer layers chemicals can be applied with a brush. A more durable protection is provided by pressurized immersion whereby the protective agents are forced deep into the core fibbers of the tree. Such timber is called „impregnated timber“. The unorthodox cell structure of spruce will not permit the use of pressurized immersion. Heat treated timber is gained by exposing the timber to high (180–230 °C) temperatures. A process like this will affect the chemical and biological structure of the wood, thereby impacting its quality. Heat treated timber is more resistant to abscess, deformations caused by humidity are diminished, weather-proofing is enhanced, weight and bending strength are decreased and resin is steamed away. The process utilises only heat and steam – no chemicals or other synthetic components are applied. Heat treated timber is used in both interior, exterior and sauna linings. It can be used as floor boards or for making doors and windows. Heat treated timber should not be used in contact with ground which can lead to saturation with water.